Since arriving back on Koh Tao after the Full Moon party, I’ve been fully immersed in the Scuba lifestyle. 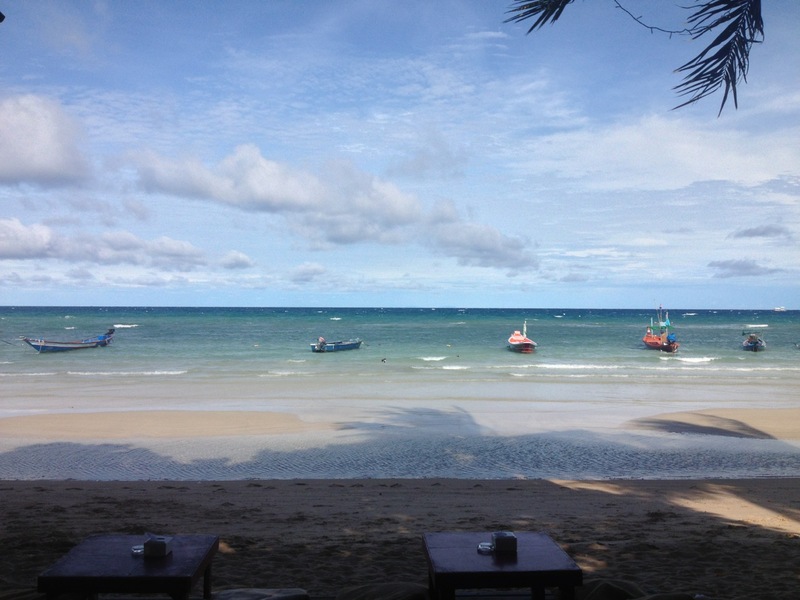 (…Or perhaps the Koh Tao lifestyle, but I’ll write more about that later.) I’ve been diving nearly every day, and when I wasn’t diving I was most likely in class working on a diving certification. Most recently I obtained my “Stress & Rescue” certification – a class I signed up for (and paid for) that would open the door to getting my Dive Master (DM) certification if I wanted to pursue such a thing. And that has been the million dollar question of the last week. I went to bed around 4:30 AM today after dancing and running around with a motley crew of Aussies I met on the beach. A few hours later, awake, I spent two hours this morning looking at this. I had breakfast for roughly $2.50 while breathing in fresh sea-breeze and staring at this beach. 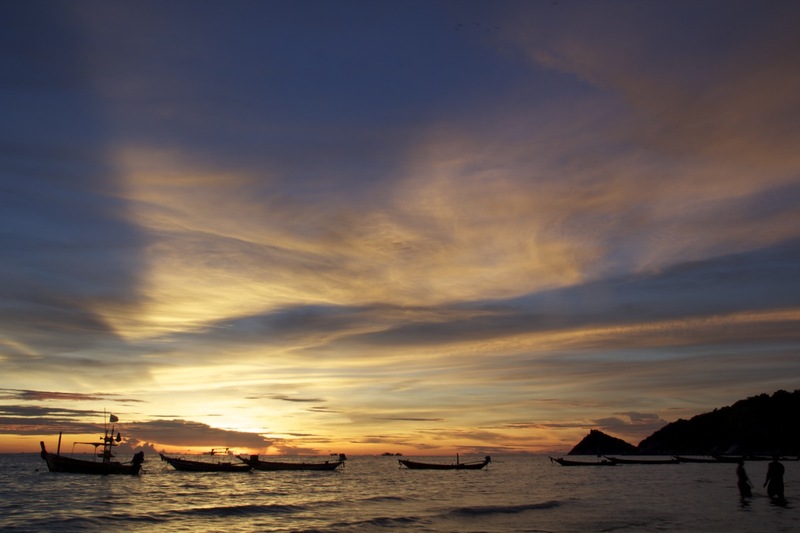 My head was going back and forth between a 13 inch electronic screen filled with train schedules and ferry routes, and the natural beauty of the Thai beachfront. My visa clearly states that I’m allowed to stay here for another 30 days, and yet here I am trying to plan an escape route. Ironically, according to my visa it’s my upcoming birthday on July 3rd that marks the end of my stay in Thailand. I am absolutely convinced that there is something completely insane and wrong with everything that is going on right now. And so…while typing these thoughts out and lamenting my decision to leave Thailand anytime soon, I think I’ve decided to take a boat over to Koh Lipe next before heading south to Malaysia. At least I think that’s what I’m going to do, until a better idea comes along or I purchase my ticket and can’t change my mind again. On June 3rd I ran into Peter, the English guy from the Karaoke event, who had decided to come to the island to pursue his DM. At this point I was so convinced I would do the course that we threw jokingly around the idea of finding a 2-bedroom place to split. This was also the day I signed up for my Stress & Rescue class. A day later on June 4th I spent a few hours making various Pro/Con lists about what to do, and even when so far as to list out every possible expense that I would incur for doing the DM course (class, housing, food, equipment, ect) and compare that with the cost of continuing along the rough travel map I have in my head. Interestingly, this was all on the ‘left’ side of my notebook, while on the ‘right’ side was a 18-25 day itinerary through Malaysia that ends in Singapore with a flight to Bali by my birthday. According to my notes, at this point I was leaning AGAINST staying here for another 6-8 weeks in favor of finding out how much more of the world I could discover during that time. On June 7th we had our “Hell Dive” – a practical final exam of sorts that involves taking an instructor underwater and solving all of their problems while they act like complete jackasses. It was comical how quickly these guys could completely take off their weight belt, fins, mask, and flotation device underwater. If he wanted to, the guy I was with could have been completely naked underwater in no more than 5 seconds. Ironically, dealing with all of these issues so well and having such a great time made me start leaning yet again TOWARD staying and doing the course. This idea was strengthened by the fact that after being at the dive school for nearly two weeks now – I’ve started to get to know a lot of people here and made the beginnings of friendship with various people. At the end of the day on the 7th (yesterday) I was about 90% sure that today (the 8th) I would go and turn in my 10,000 Baht ($330) DM deposit that would entitle me to free fun-diving for as long as Big Blue Diving is around. Ultimately, after more waffling on this decision than nearly any other recent decision I can think of (when to quit Epic being the only other recent one that comes to mind), I’ve decided to pack up from Koh Tao and head south through Malaysia and onto Indonesia. As far as I can tell, my plan is still to be in Bali for my birthday. I now need to figure out how much of my previous pseudo-itinerary through Malaysia fits into the number of days I have left and figure out when to leave this island. As it turns out – according to the calendar I was keeping on my laptop I’m apparently a few days late. Alternatively, now that I’m settled on the idea of not pursuing the DM the other idea I’ve been throwing around in my head is how much more diving I may want to do before I leave here and when I want to leave. Since I am technically now qualified to start my DM, I could abuse the system and pay my $330 dollars and dive four times a day for ‘free’ for the next week. As fun as the idea sounds, I don’t think I’m going to do that. This entry was posted in Thailand, Trip Planning, What's up with Mike and tagged Divemaster, Diving certification, Ko Tao, Koh Tao, Scuba diving, Stress and Rescue, Thailand. Bookmark the permalink.